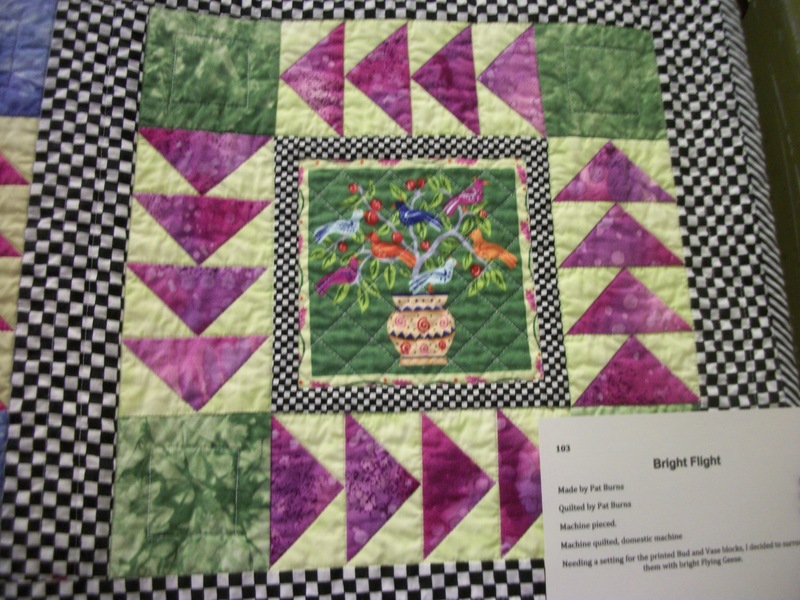 Friendship Samplers is the Pine Tree Quilting Guild chapter located to Camden’s north, in Belfast, Maine. 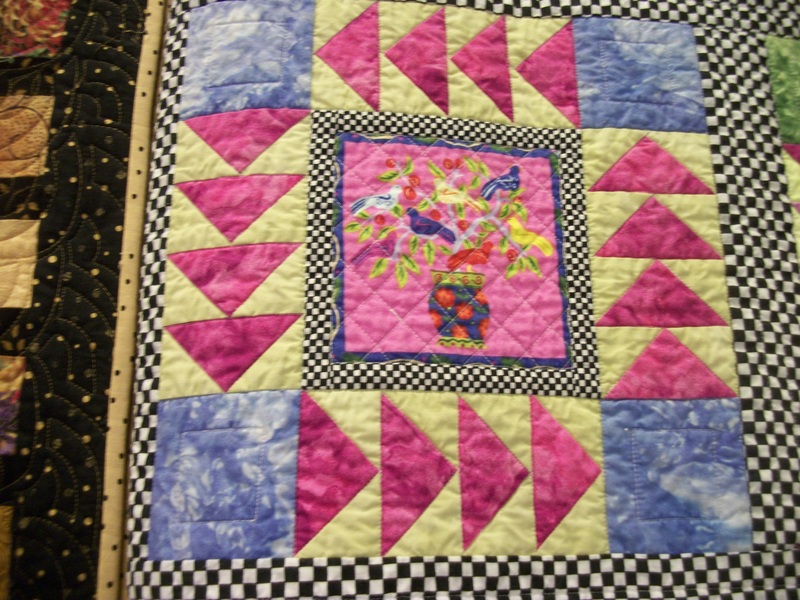 The Friendship Samplers quilters are strong, competent, wonderful quilters. There is just so much talent in that group. 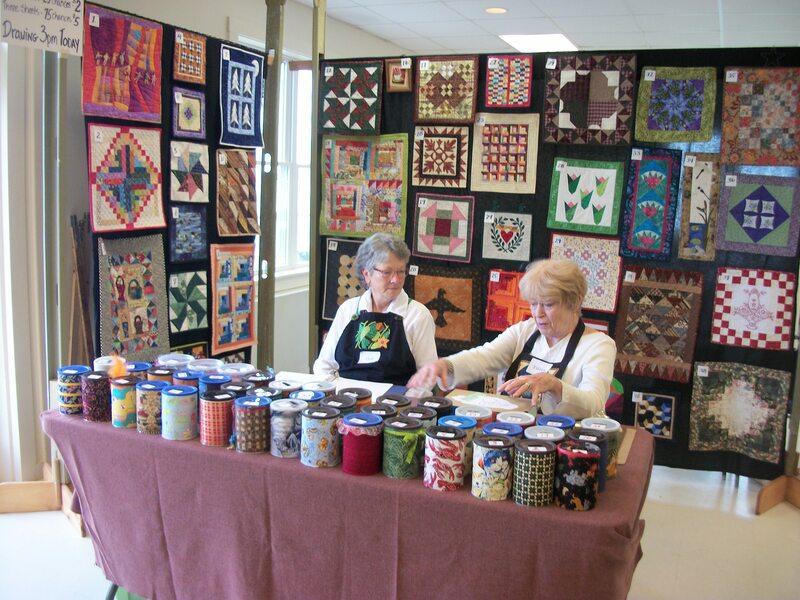 They do a quilt show every other year, and this year was the year. And this year, their show was as wonderful as ever. 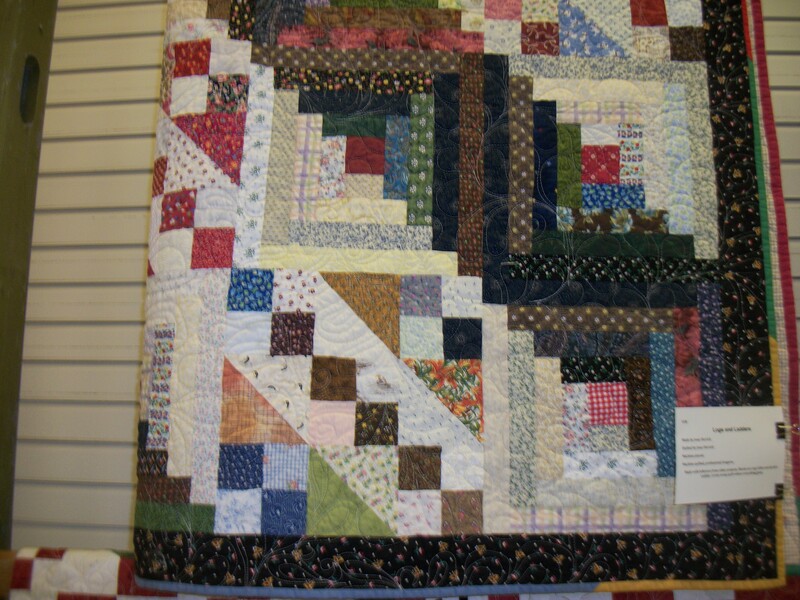 I did not begin to take pictures of everything–or even of some of the most amazing quilts–and there were many. I took pictures of work that stimulated my own creativity. 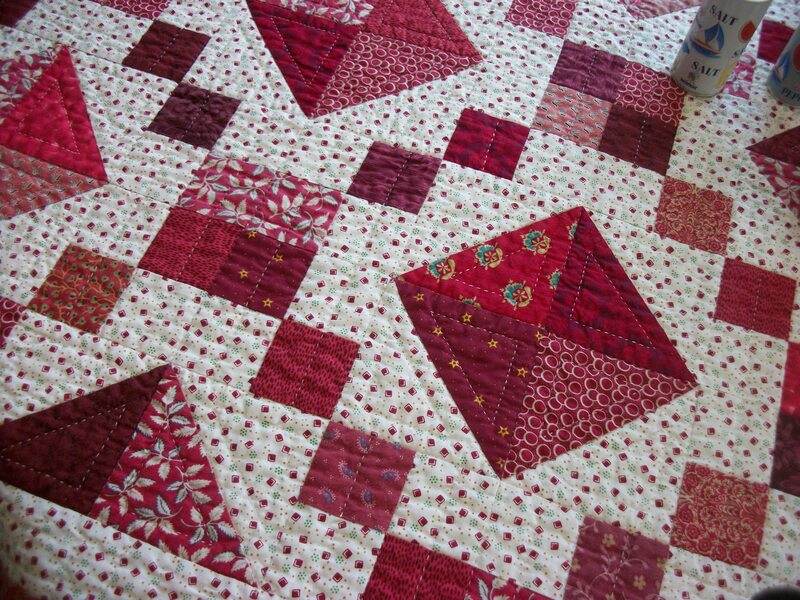 And do remember that the quilts I love best are scrappy quilts that are functional. 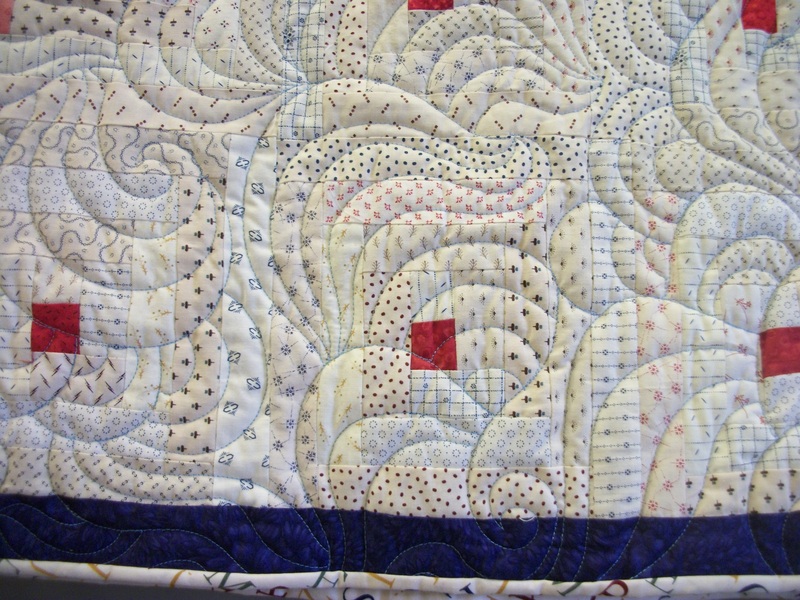 First, my most favorite quilt was my friend Joan Herrick’s “Logs and Ladders”–where she has combined a log cabin block with a Jacob’s Ladder block–and took advantage of their strong directional orientations. There’s one of these in my future! 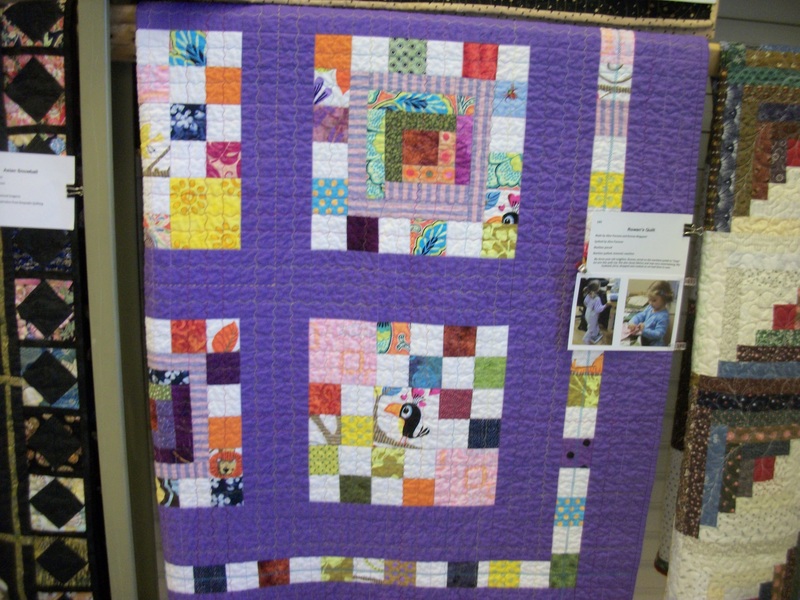 I was intrigued by the quilting in this quilt–and later realized it’s called “McTavishing,” after Karen McTavish, who invented it. 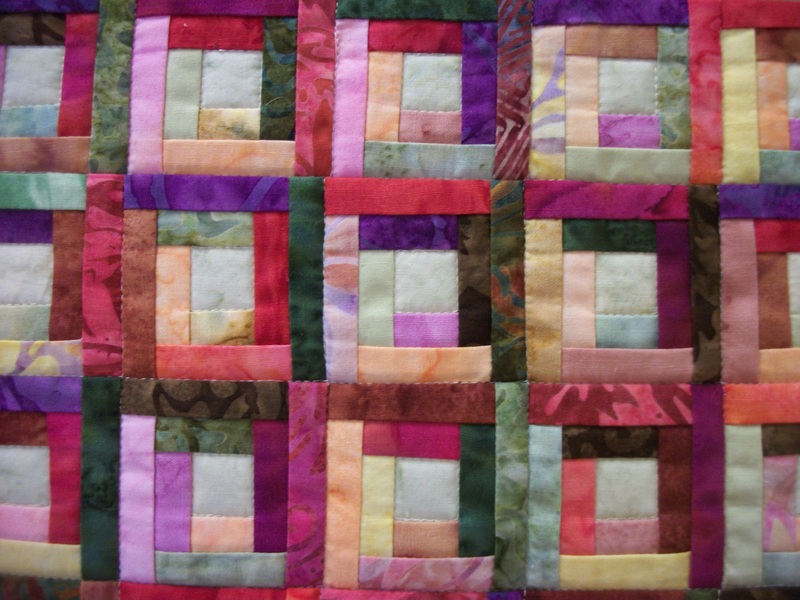 You can see how to do it on Leah Day’s web site, along with at least 400 other free-motion quilting designs she has put onto utube videos. Don’t you love this modern “take” on the log cabin block? 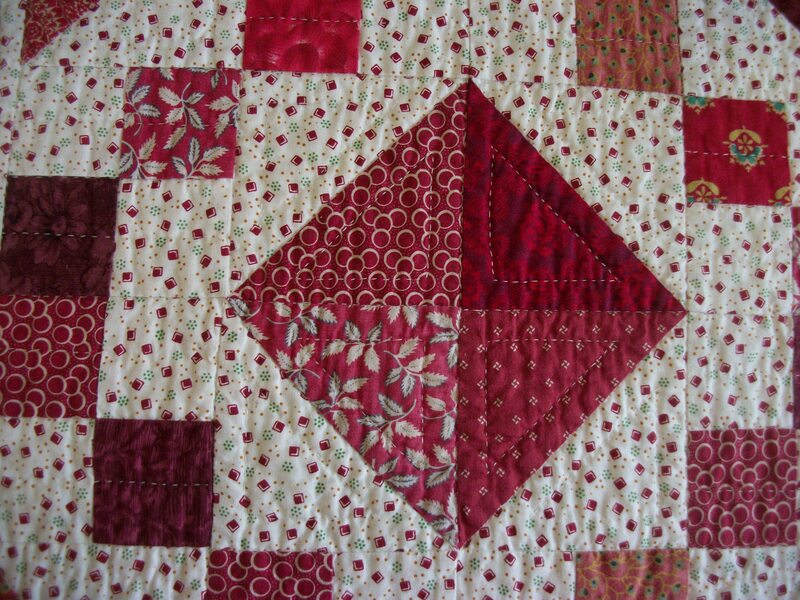 It’s stitched with bright orange thread in squiggly lines up and down the quilt. And look at the use of purple for the sashing. 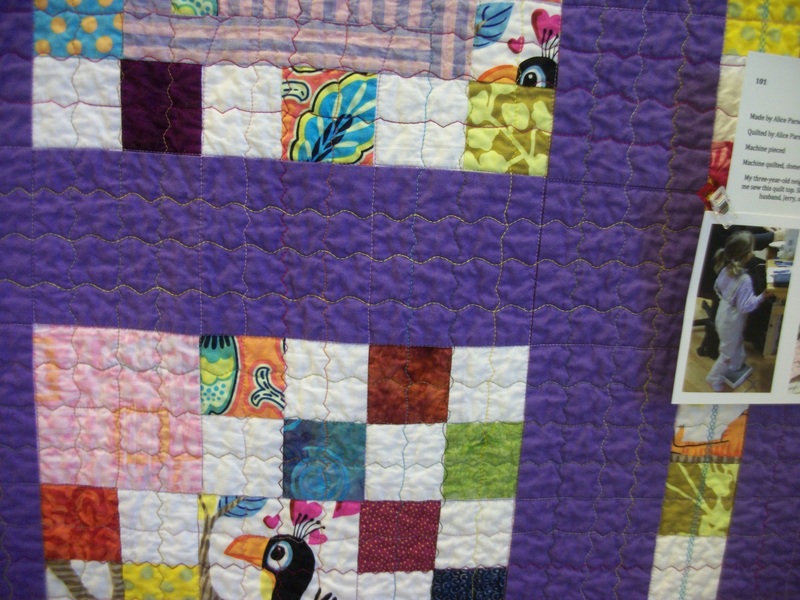 That purple is making the yellow leap out of the quilt! 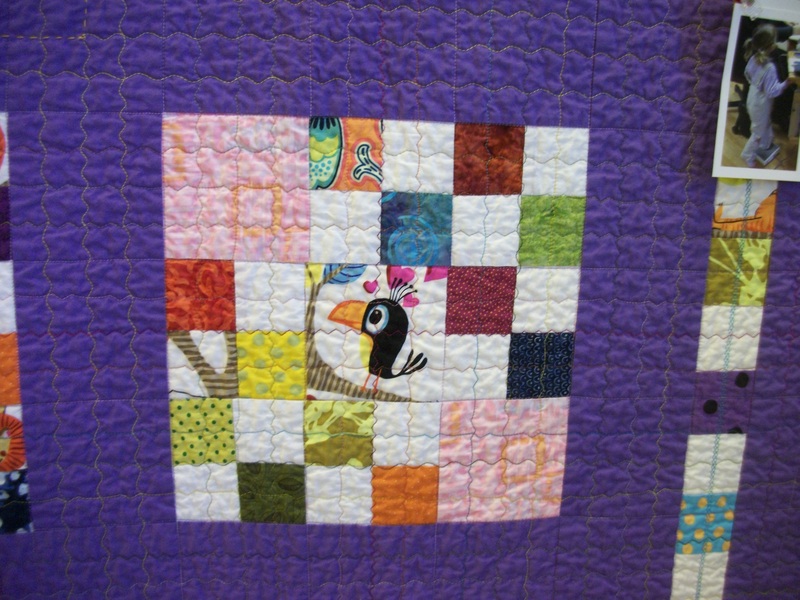 I want to make a quilt with birds at the center of some kind of block. 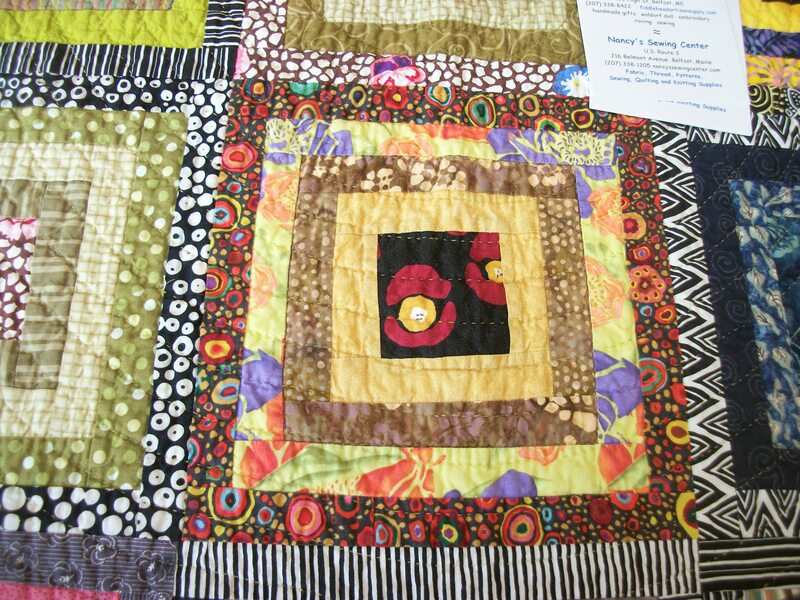 And I love what these quilters have done here. It’s just so much fun! The flying geese and their backgrounds can vary in color choice. 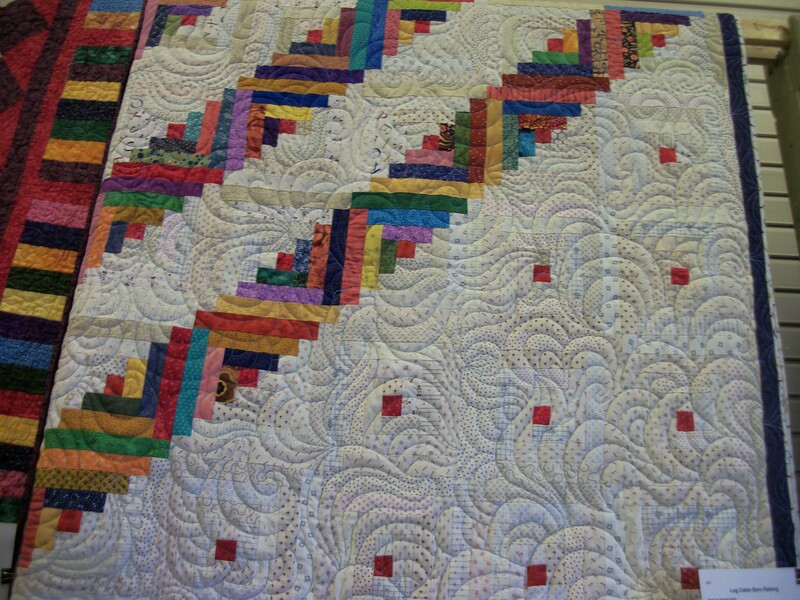 What’s uniting the quilt here is the sashing/border fabric–in this case black and white and the use of the center square with a border around it. 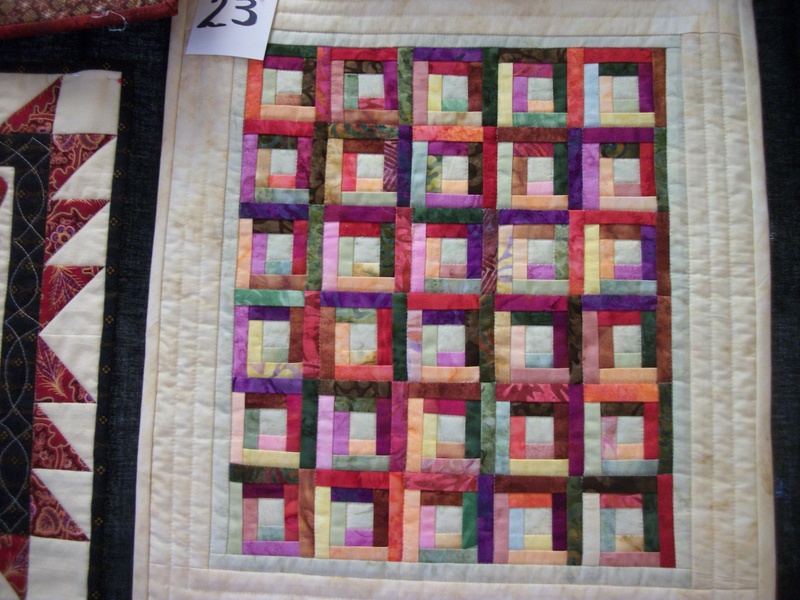 The Friendship Samplers always have a “quilt alley” where you buy chances (25 for $2!!!) and put your chances in the can/s of the quilt/s number you like. All these quilts were to be “won” on Friday. Another set went up on Saturday. 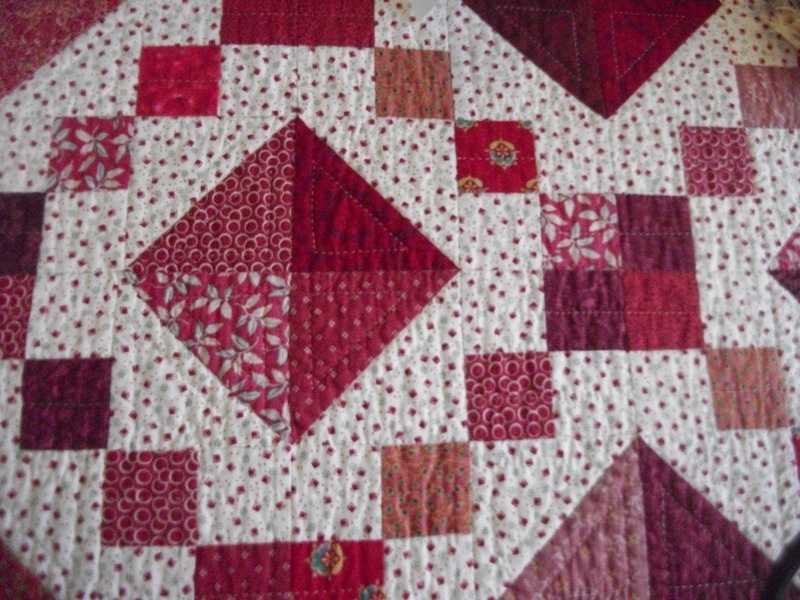 This quilt was HAND STITCHED!!! Imagine it made in any number of colors–as long as you keep the light and dark values: blue, yellow, orange, brown, etc. 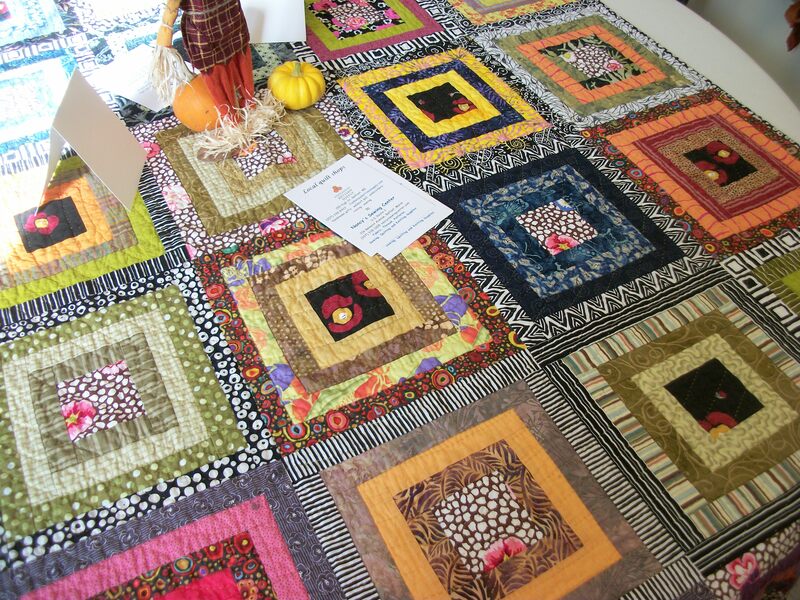 SO, our group really enjoyed the Friendship Samplers Quilt Show 2013 and look forward to attending in 2015! After the show we had lunch at Chase’s Daily–which specializes in local foods mostly from (in season) their farm. 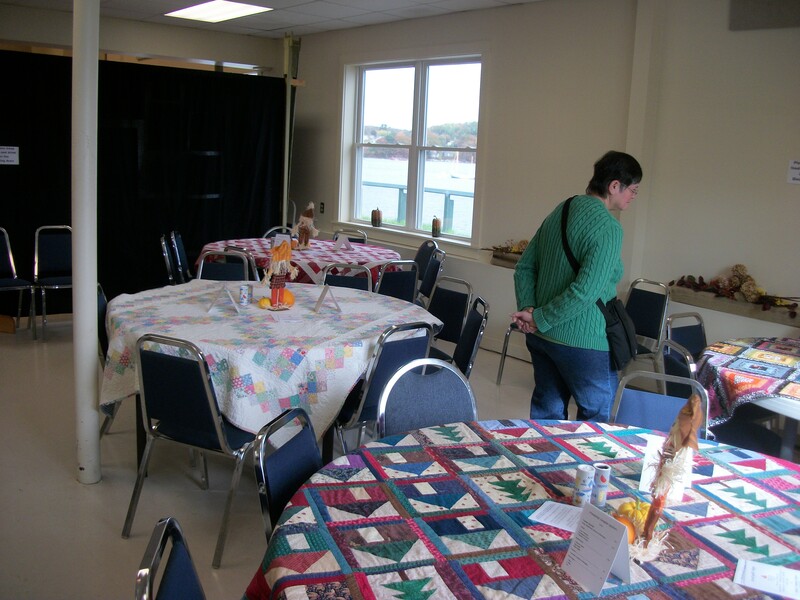 And we visited Nancy’s Quilt Shop on Route 3 just outside Belfast to pick up more of a fabric that two of our quilters wanted to buy more of than Nancy had at the show.